Do you like sword & sorcery, rules-lite, narrative or old school games? Then take a look at Blood of Pangea. When the author advertised this little game in the Rules-Lite RPG community on G+ I was interested but skeptic as well. There are lots of games that promise an interesting narrative twist on old school games. I really like the indie movement which sprang from The Forge and I like the OSR but sometimes those two directions can be diametrically opposite. 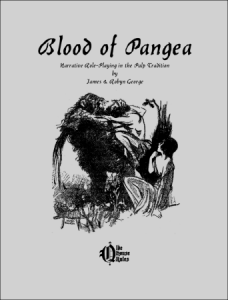 Basically, Blood of Pangea is billed as a pulpy sword & sorcery game with old school leanings but narrative mechanics. The PDF is available for USD $2.49 HERE (aff). I received a free copy for reviewing purposes. It is the newest product from Olde House Rules who already made an original old school game called Pits & Perils. P&P is a rules-lite game based on wargaming roots instead of D&D. Please keep in mind that this is a reading review and I haven't playtested the game yet. Character creation is pretty very free-form and fits the narrative bill. Like in the indie game The Pool you have a limited use of words to describe your character. The Pool uses a 50-word-story, with Blood of Pangea you have 30 words. You need to choose an exceptional trait (like speed), a craft/skill and specialized knowledge (i.e. history). Nonetheless, the game uses classes. Basically, there are Adventurers (fighters) and Sorcerers. The Thief/Corsair is a sub-class of the Adventurer. So, if you want to use magic, you need to choose Sorcerer as a class and are not allowed to wear armor and can only wield one-handed weapons. Adventurers wear armor and can choose any weapons. The Thief eschews armor in favor of stealth but otherwise the class is the same as Adventurer and may be fluid. Every character has one attribute called MIGHT which is the resource for hit points and magic simultaneously. If you take damage, you subtract it from Might. If you want to use sorcery, you spend MIGHT. A beginner character has 10 MIGHT. If this score falls down to zero or less in a scuffle, you're dead. Otherwise, it mostly means you're unconscious. The game also includes rules for money and equipment. Money is based on the silver standard and starting characters only have 3d6 SP. This definitely smells old school to me. Beginner characters also get some rations and a single weapon. Armor can mitigate up to 3 hits from any single attack and must be purchased separately from your starting money. Shields soak up to 2 hits. However, this stuff is easily breakable and after taking the hits it must be repaired or replaced. In gameplay, the player may decide if he uses the quality of armor and shields with the GM's approval. Armor also encumbers and hinders you from using stealth. In the end, armor and shields are a resource mechanic: you should use them when your life depends on it but as they break as soon as you take a hit to them, they are not useful all the time. You may wear armor (if you're an Adventurer) and up to 10 small items, plus coins. Weapons are grouped into categories like bows, one-handed melee, two-handed melee and thrown melee weapons. There is no definite weapon list, just make up your own. Character creation is fairly easy. In the G+ community of Blood of Pangea are some example characters by Mike Hill: Sorcerer and Adventurer. All in all, character creation is narrative but also has some minor old school roots like the rules for armor, encumbrance, silver coins etc. The idea behind this game is that the character's success depends more on the player's choices than special abilities and powers which is one of the old school principles. The game uses 2d6 as a basic task resolution. The target number (TN) depends on the situation, with 7 as a challenging task, 9 daunting etc. The difficulty is up to the GM (who is called the judge). Remember that there are no bonuses adding to your die roll as there are no attributes in this game. Blood of Pangea gives us some guidelines on setting the TN but relies heavily on the GM's call. For example, picking locks may be daunting while following a trail may be challenging. Attempting a craft or skill varies in difficulty (yes, that's what the rules say). In combat, characters are hit with a daunting difficulty (that's a 9). The GM decides about the difficulty for foes. Initiative is rolled at the beginning of a fight for the whole party with 1d6. Weapon damage depends on how well you've met the TN. You do 1 to 2 hits per blow. Two-handed weapons deal an extra +1 damage. The game also includes simple rules for rest and recovery and natural hazards, poison, bear traps and similar. A character may use 1 MIGHT to add +1 to any physical attack. Sorcerers use it for casting spells. Although characters are supposed to be heroic, it's a bit difficult to heal. Each day of rest grants 1d6 MIGHT and there is no magic healing available. Again, this is all subject to the judge. So you might decide that the characters can shrug off harm more easily, otherwise the game could be quite deadly depending on the number of foes and traps you throw at your players. The approach to magic is narrative again. There is no spell list. Sorcery is draining and costs a minimum of 1 MIGHT. The cost increases if you want a wider radius or more targets. Interestingly, characters cannot use sorcery to permanently damage or destroy targets per default rules. Contrarily, NPCs can always use spells to injure at a cast of 1 MIGHT = 1 hit. The judge may optionally allow player characters to use this rule, too. The game uses a basic achievement-style system. There's no EXP for gold or something like that. Instead, if you go on an adventure, you gain 1 EXP. If you perform extraordinarily, you get +1 EXP and if you complete a quest, you get +2 EXP. As there are no levels in Blood of Pangea, advancing means you can decide to improve MIGHT, learn another language or learn a new skill. The amount of XP you need to spend varies. For instance, to gain +1 MIGHT, the player needs to have acquired 7 EXP. A menial skill (physical training etc.) costs 1-3 EXP, a skilled trait or specialised knowledge 3-5 EXP. NPCs come in three flavors: minions/thugs, commoners and heroes/villains. The book includes some sample beasts like bears, elephants or wolves. There are some suggestions for including nameless horrors into your campaign. Additionally, there are a few adventure ideas and suggestions for mapping adventures and travelling. The index contains a broad-strokes setting idea: Pangea. It has 6 kingdoms, each described in a short paragraph. Moreover, there is a small bestiary containing Ape-men, Jin, Kraken, Ymirs (giants) and more. You also get a small map of the island of Pangea. There is a pantheon and some monstrous and alien gods with rules for madness. The game doesn't include beginner game mastering tips (which isn't necessary). The game rules are quite simple and open to interpretation and GM fiat. The advice helps but is pretty general. There is no sample adventure. Although it's not spelled out directly I have the impression that the game rules are supposed to provide a framework and the GM/judge should make up rules/rulings depending on the situation. This would fit the old school idea. The PDF is 34 pages total (including cover etc. ), completely held in black and white. The illustrations are from the public domain and are thus are not that nice looking. The layout is very simple with one column. Like the other Olde-House-Rules-products Blood of Pangea uses an antique-looking typewriter font. While it conveys a certain old school charm it's not easy to read. Visually, this product is ok but nothing special. Yes, this game is narrative and old school. It doesn't have lots of rules and thus requires some communication between players and GM to make it work. The GM is the ultimate arbiter of how things work. I like the free-form character creation and the sorcery rules. Sorcery can be useful but it's not overpowering because you need to spend MIGHT (your hitpoints) to cast spells AND per default you can't use it to harm someone directly. Although the sorcery rules are quite free-form there is enough guidance on how much a spell costs and what range and effect it might have. The game interestingly makes use of resource management (like in old school games): do you use your armor to mitigate a hit, do you use your MIGHT to land an additional hit or use sorcery or do you reserve it as it is also your hitpoints? Furthermore, you could easily skin this game to other genres and therefore it provides some utility. In fact, a retro sci-fi supplement which was previously released for another system, is planned for Blood of Pangea: Retrospace. I would have liked to see a better looking visual presentation with another font and better illustrations. Furthermore, some rules (i.e. armor) could be more clear. The section for the judge is a bit short and assumes that you're already familiar with RPGs and with the genre. I feel that this is one of the games which put a lot of responsibility on the GM/judge. There aren't a lot of rules and it will come to the interpretation and the GM's call on how to handle situations (setting difficulties, how rest & recuperation works etc.). The inclusion of a broad-strokes setting and nameless horrors is nice. All in all, for USD $2.49 this is a neat rules-lite sword & sorcery game.